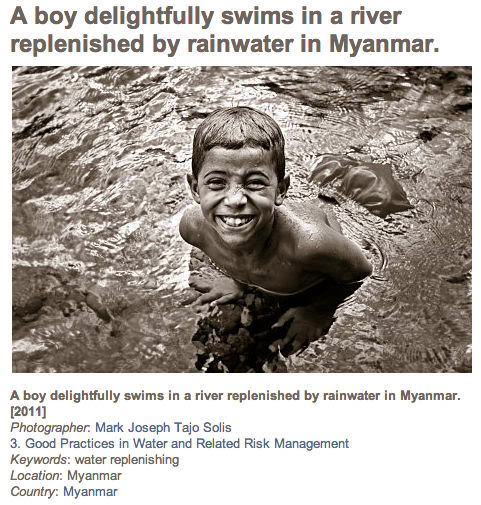 Mark Joseph Solis, an alumnus of the University of the Philippines - the country's premier state university - admitted to passing off as his own a photograph that won the Smiles for the World Calidad Humana contest sponsored by Roberto Mayorga, Ambassador to Manila of the Chilean Embassy. Solis is a political science alumnus of UP and is currently taking up his Masters in Public Administration at the National College of Public Administration and Governance. The website of the International Association of Political Science Students said Solis is a legislative staff of Senator Pia Cayetano but Senator Pia already tweeted that Solis was just a probationary staff employed for just three months and is no longer connecetd with her office. 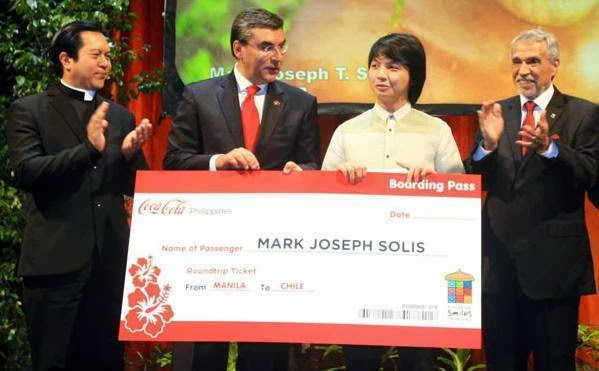 Solis was awarded $1,000 and round trip tickets to Chile and Brazil last September 18, Chile's National Day celebration, at the Cultural Center of the Philippines. Social Entrepreneur Gregory John Smith, the real owner of the photograph, revealed how "an impostor... abused my copyright." The photo belonged to the Children at Risk Foundation, which he founded. What is more shocking was that this was not the first time that Solis entered contests using photos he doesn't own. 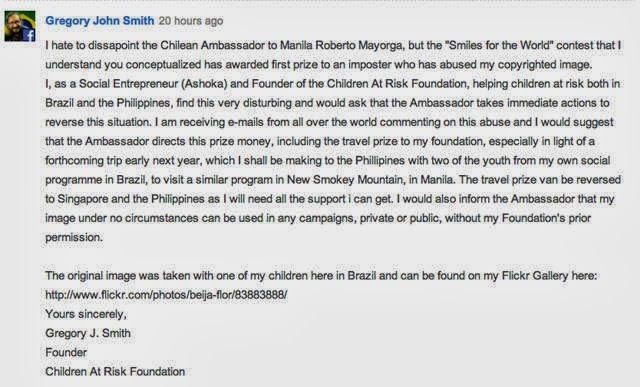 Gregory John Smith also posted this comment on the article about the Ambassador and his contest on Rappler. It is depressing to hear about these kind of news perpetrated by a fellow Filipino joinig international competitions. It is bringing Filipinos into a bad light in the eyes of other countries. They might generalize Filipinos as plagiarist and cheaters. Shame on Solis for doing these despicable acts, not just once or twice but several times, which makes me assume that he has no respect for the works of others and has no personal integrity or talent to come up with his own creative work. He does not realize that the Internet allows everyone to keep well informed and connected that any form of cheating will eventually be discovered. Solis is sick! He should be banned from all competitions and be given some form of punishment for his evil deeds. Rest assured that his actions will not be tolerated as Solis has shamed us in the eyes of the world. What was his course again? Masters in Public Deception? Is he training become a politician and be part of the idiots who are wasting the government's money and taking credit of the things that they've never worked hard for? May future tong batang to. I agree. These kind of people only shame us. I just hope the Filipinos will not be generalized as photo thieves and cheaters. I agree with Firetongue. He is indeed from the University of the Philippines and he is representing our country. What a shame. He should've used his own photos and won the contest by his own skills. I really do not understand why he has the guts to try his luck with the property of others. Must be because he previously won in other competitions with the stolen photos as well. He got greedy and now he will suffer the consequences. Wow! UP student nga! Galing nya pumili ng winning photo entry! Aaral aral pa kayo sa mga mamahaling kolehiyo. yan lang din pala ang ituturo. wala kang pinagkaiba sa mga snatcher at holdaper sa kalsada. wala naman po akong masasabi sa pagkumpara ninyo sa ginawa niya sa gawain ng mga holdaper at snatcher. gusto ko lang po sana malaman kung bakit ninyo sinasabing nag-aaral po siya sa isang mamahaling koleihyo kung nanggaling po siya sa UP na siyang primera eskewla ng bansang sikap na nagbibigay ng mura at kaya sa masa. Bakit naman po kailangan gawing pangkalahatan pa ang inyong pahayag, kung pwede naman pong sabihin lang ito at ipatungkol lamang sakanyang nagkamali o mayroong mali. He should pay the owners of those pictures he used. I am very dismayed what Mr. Solis did. Being a former student of the country's most prestigious school, he should have known better than to win contests using other people's work. In my opinion, he should have never even entered those contests at all. I hope he learns a big lesson from all this publicity and bring him to shame for what he did because it is a shameful act to use other people's masterpiece to gain attention. Plagiarism only shows how inferior a person can be. Disappointment to our country. He as a graduate from UP must know that the college strictly discourages plagiarism in any forms. He still got what's coming to him, being embarrassed in front of a lot of people and an ambassador of another country. Everyone knows that you should not claim something that isn't yours most especially if you are a graduate of the University of the Philippines. It's not only a shame to the university but to the whole country. We will be judged as a whole because of his act. I believe that he can do better if he did not plagiarized. Well, I hope this have been a lesson to all - to never plagiarize instead do their best to have a work that they can be proud of. It is just disappointing that a graduate student from the University of the Philippines could act such crime. He act like he is not a well-educated person. Well, sorry for the word, but he deserve it. Doesn't he know that plagiarizing is an act of crime. It is a shame. But at least he admitted his crimes..
Maybe he never learnt it at UP? Ya think? Maybe every public school elementary graduate should know right from wrong? Maybe his parents never taught him? Or maybe it's not wrong unless you are caught (he only admitted after he was caught)--driven by shame not by honor . . . Let's not kid ourselves, the role models among our elected officials are few and far between . . . this is petty compared to their excesses. So should we expect more when our most powerful leaders rob us blind in the guise of charity?--there are hotter places in hell reserved for such evil people. The bigger question is how many of the people directly involved in the fertilizer fund, pork barrel, Malampaya Fund, and computer procurement at the DTC are UP graduates. Answer: dozens. And where did the rest go to school. If UP cares, they should revoke their degrees and publicly rebuke them--admin has no stomach for that. But they won't: they are too powerful, they own UP.